Imagine if every morning you had to do physiotherapy to clear your lungs of mucus and then take several different antibiotics, digestive enzymes (Creons) and vitamin supplements, as well as having breakfast and getting dressed. You have a detailed daily list of medications and treatments; not just once a day but, with some modifications, several times throughout the day. Once in a while you may get infections which need additional treatment, such as intravenous antibiotics. On a regular basis you will have hospital appointments to fit in as well. For Matt Johnson this is his routine. Like his older brother Tim, he was diagnosed with cystic fibrosis as a baby. As a child he would lie head down on a sloping bed twice a day, so his parents could help get the mucus out of his system. Nowadays, he has active breathing exercises which help bring up the mucus without the damaging, and energy-sapping, effects of coughing. Johnson’s parents encouraged him to be active. As he got older he cycled everywhere and, growing up in Rickmansworth, nearly anywhere he wanted to go involved cycling up a hill. Cycling became part of his life for trips to school, work, the supermarket — but he hadn’t really considered doing any long-distance events. Then, about three years ago, Johnson invested in an exercise bike and started doing a daily 30-minute session on it, partly to help his condition. As he got fitter he increased the difficulty level on the bike. He decided, as so many people do who train regularly, to look for a formal goal: a recognised event which he could get sponsored for, and thereby raise money for the Cystic Fibrosis Trust. He entered the London to Paris bike ride. 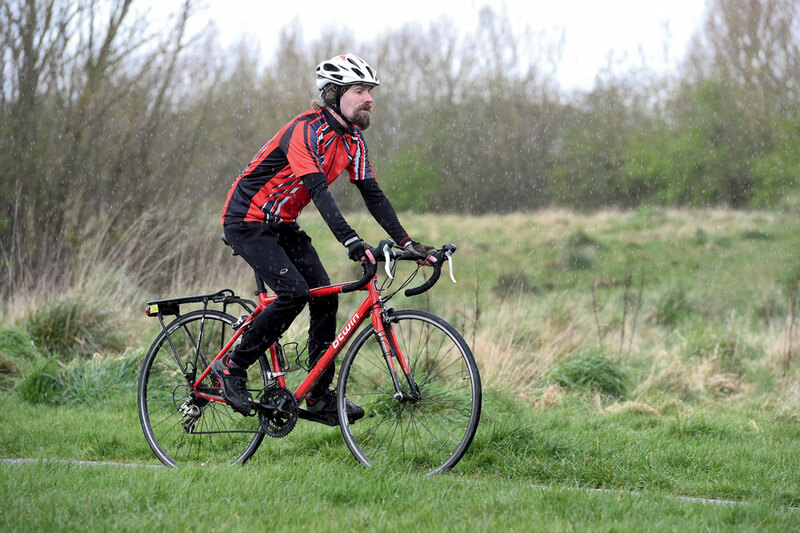 Several months before, he worked out a programme to increase his stamina and mileage, until he was doing a 36-mile training ride twice a day, sometimes two days in a row. With a condition like cystic fibrosis, training for a staged long-distance event is not something to undertake lightly. Johnson’s mutation of the CF-causing gene means that his digestive problems tend to be worse than his lung problems, and two years ago he was diagnosed with type 2 diabetes, as the CF affected his pancreatic functioning. This means that Johnson needs to eat a huge number of calories each day, while also taking enough insulin to counter the effects of sugars in the food. As Johnson’s body doesn’t get all the nutrients it needs anyway — he struggles to reach 50kg in weight — he has to carefully balance the benefits of exercise with the extra demands for food. His minimum calorie requirement per day is 2,500 calories, but this increases to 3,000 per day when he is cycling long distances. He has various fruit juice-based supplement drinks, which provide a power-packed 300 calories in just 150ml, and Creons help with food absorption. Also, to the envy of anybody trying to lose weight, his dietician told him to grate cheese on everything and to fry food! Regular exercise has meant that Johnson’s lungs are functioning better now than they have for some years, and he’s also found that he’s good at hill-climbing, partly as he’s light. With at least three major climbs on the Coast to Coast (Honister, Whinlatter and Hartside), this should stand him in good stead. Johnson lives with his wife Tania in Warrington and works 30 hours a week as the North West regional administrator for Christian Aid. You can follow Johnson’s progress on his blog at mattyj1979.wordpress.com. Around 10,000 people in the UK have cystic fibrosis, an inherited condition caused by a faulty gene. One in 25 people carries the gene. If two carriers have a child it has a one in four chance of having CF. The defective gene is the one which controls the movement of salt and water in and out of the cells, and this leads to a build-up of thick, sticky mucus. This mucus clogs the lungs and leads to life-threatening lung infections, and also obstructs the pancreas, preventing natural enzymes from breaking down food for absorption of necessary nutrients. There is currently no cure for cystic fibrosis. In the 1960s a child diagnosed with CF would be lucky to reach his or her fifth birthday. However, significant advances in treatments — nutrition, physiotherapy, antibiotics and, when necessary, transplants — over the past 50 years now mean that more than half of the current population with cystic fibrosis will live to be over 40.